Member of the Apiaceae or Umbelliferae (parsley family). 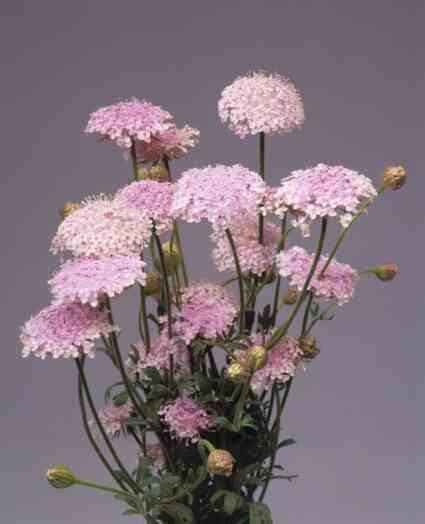 Common relatives include Queen Anne’s Lace, Bupleurum, dill and fennel. Has flat or rounded lacey clusters of small flowers at stem ends. Stems from 12-16 inches long, branched. 36-41F in water for a short time. From the Greek “trachys” (rough) and “meninx” (membrane) referring to the fruit. The specific epithet name “coerulea” means blue, in reference to the flower color. Plants of this family often exhibit strong or pungent odors, many grown for food, flavoring and medicinal reasons while some are also grown for ornamental purposes. Useful as a filler in bouquets. Starman et al. (1995) rated this species (‘Himmelblau’) as being an average income producer.